My first "deal" post, so go gentle on me! I bought this set a couple of weeks ago from Tesco Direct as part of a 3 for 2 offer. 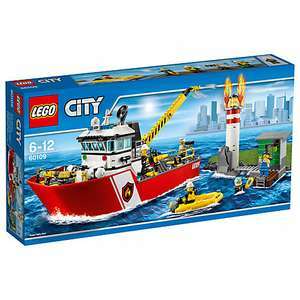 The RRP is £64.99 (https://shop.lego.com/en-GB/Fire-Boat-60109), and it arrives in a sizeable box compared with the usual £30-40 Lego sets. I've not opened it yet as it's going to be a Christmas present, but it does look like the hull is a one piece construction so should float in the bath. There's the lighthouse and dinghy to make too, and a crane to aid imaginative play. I'm quite impressed. Now THIS is a good price. Grab it, go, go, GO! I love LEGO, and the bigger kits are brilliant to open up - several hours of fun right there! Paid £21.16 for good condition @ Amazon warehouse. Coming today, hope the box is not too badly damaged. Paid £21.16 for good condition @ Amazon warehouse.Coming today, hope the …Paid £21.16 for good condition @ Amazon warehouse.Coming today, hope the box is not too badly damaged. Normally it's for me but this set is actually for my daughter. I probably won't mind if the box is squashed/scuffed as long as it's sealed. You're also buying from a well respected store. Fire Boat measures over 11" (30cm) high, 12" (32cm) long and 6" (16cm) wide. Lighthouse (with pier and shack) measures over 6" (17cm) high, 6" (15cm) wide and 3" (9cm) deep. Dinghy measures over 3" (9cm) long, 1" (5cm) wide and under 1" (2cm) high. Was this one of your two deals you posted then, or was it one of your other many comments. Was this one of your two deals you posted then, or was it one of your …Was this one of your two deals you posted then, or was it one of your other many comments. No! I just say it as it is! This set will never sell at RRP - FACT! Deal posting newbie! This is marklilliman first deal post. Help out by leaving a posting tip or just to show your appreciation for their contribution.